A contemporary twist on the hoop earringsLana crafted these diamond-detailed gold earrings into a hook silhouette that loops through your earlobes. Hook silhouette loops through ear. 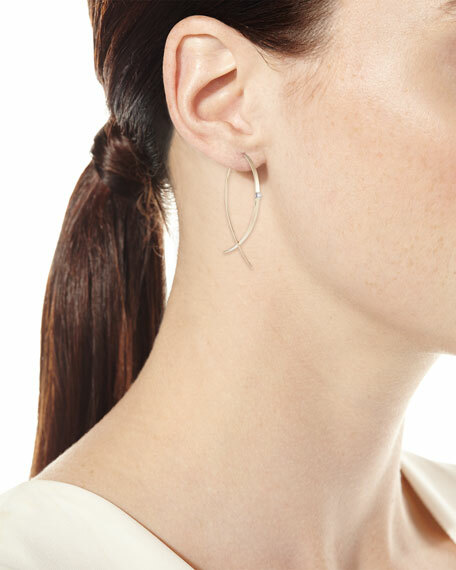 Armenta hoop earrings from the New World Collection. 14-karat gold and blackened sterling silver hardware. Metallic blue enamel hoops with diamond crivelli. 0.22 total diamond carat weight. French wire for pierced ears. Approx. 1.6"L drop (41mm). Made in USA. Set of two small hoop earrings by Jude Frances. 18-karat yellow gold. White pav?? diamonds. 0.60 total diamond carat weight. Set of two small hoop earrings by Jude Frances. 18-karat yellow gold. White pav?? diamonds. 0.60 total diamond carat weight. Set-in post backs for pierced ears. Made in Thailand. Please note: Charms, shown, are not included.